The Road RasCals have completed their journey and arrived safely on the West Coast. 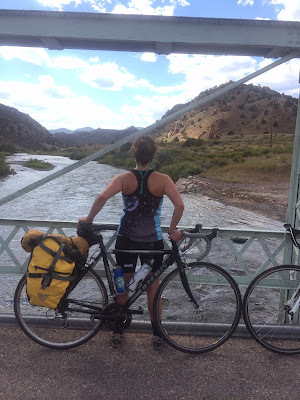 Kloe and Lilly biked from Denver, CO to Los Angeles, CA this Fall in order to raise money for The Bridge School. It has been close to two weeks since we arrived at Manhattan Beach (which is in LA). I would have sent this out sooner, but coulda-shoulda-woulda. I want to send a final thank you to everyone for supporting The Bridge School and us in this adventure. We raised over $2,000 for the school and even got a thank-you comment on the blog from the executive director of The Bridge School. As many of you know (because I never stopped talking about it), this trip absorbed my life for the six-plus months leading up to it, and I want to say a particular thanks for putting up with me having no other conversational topics during that time. I could go on for a while saying thanks and telling you all how amazing you are, but unlike me, you all have jobs and don’t have endless time to read the emails I send. So alas, I’ll just end here with a final Thank You for helping raise money for a school that I care a lot about and that does some amazing work. Awesome job Kloe and Lilly! Keep on pedaling in the free world! I'm so proud of my daughter and her friends for completing this ride. Yes, quite the achievement and every right to be proud. Keep on pedalin in the free world Lilly & Kloe!